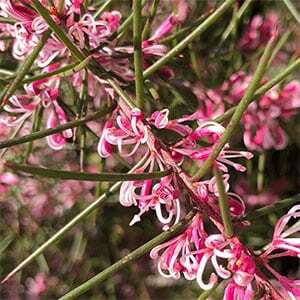 A medium sized shrub with an open slightly weeping habit, Hakea decurrens comes in two forms with different flower colours. The white flowering form is the most common, however the pink form is very popular in cultivation. Both forms are attractive, and both act as bee magnets, and both are great for attracting birds to the garden when in flower. This is an easy care species. It requires a well drained soil and good sunny position. It also copes with windy positions. Light pruning after flowering will help maintain a good bushy habit, or regular pruning can create a semi formal hedge. In areas of wet soils it is a good idea to improve the drainage before planting. This can be achieved by hilling up the soil where the plant is to be located, or using a raised garden bed. In reasonable soils no additional fertiliser is usually required. A specialist native plant fertiliser can be used in poor soils if required. Height – To around 1 – 4 metres. Spread – To around 1 – 2 metres. Flowers – White or Pink flower in spring.